Davies categorized Puvis as a classicist who provided an integral link between the Neoclassicist Jean Auguste Dominique Ingres and Fauve Henri Matisse. Contextualized in relation to the traditional and familiar, Davies presented the new movements as the culmination of a modernist progression, lending a clarity and comprehensibility to their relationships to the past. Aimee Brown Price, Pierre Puvis de Chavannes, Vol.2 (New Haven: Yale University Press, 2010), 155. The same critique was leveled against the Post-Impressionists years later. “Further Impressions of the International Show,” New-York Tribune, March 9, 1913, 6. Arthur B. Davies, “Chronological Chart,” Arts & Decoration Special Exhibition Number (March 1913): 150. Davies ensured that Puvis’s work held an important place in the Armory Show. One of the organizers’ goals for the exhibition was to educate viewers on the evolution of modern art—from Jean-Auguste-Dominique Ingres, Eugène Delacroix, and Gustave Courbet to the Impressionists, Post-Impressionists, and Cubists. To that end, they showed a number of historical works, and Davies devised and published a “Chronological Chart Outlining the Growth of Modern Art.”  Its message was that the last hundred years of art to its current stage displayed a clear progression, as one innovation led to another. The outline was meant to normalize the new and to demonstrate that many artists whose work once seemed outrageous had a later history of being acclaimed. Given his popularity in the United States and his influence on American painters, it is no surprise that Puvis was highlighted among the historical painters: fifteen works by him were included in the exhibition, all lent by American collectors. See Aimée Brown Price, “Puvis de Chavannes, Pioneer and Paragon of Modernism,” in The Armory Show at 100: Modernism and Revolution, ed. Kimberly Orcutt and Marilyn Kushner, exh. cat. (New York: New-York Historical Society, 2013). His was also a major influence on the muralists Kenyon Cox and Edwin Blashfield and the painters Arthur Wesley Dow and Maurice Prendergast. See Aimee Brown Price “Puvis de Chavannes and America,” in Toward Modern Art: From Puvis de Chavannes to Matisse and Picasso, ed. Serge Lemoine (New York: Rizzoli, 2002), 201. Price, “Puvis de Chavannes As Pioneer and Paragon of Modernism,” 233. 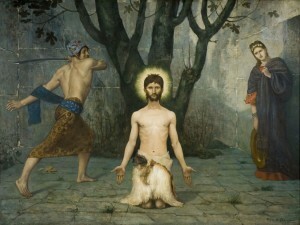 Susan Elizabeth Earle, “Puvis de Chavannes and America: His Artistic and Critical Reception, 1875-1920” (Ph.D. diss., New York University, Institute of Fine Arts, 1998), 272. The chart was published in Arts & Decoration 4, no. 3 (March 1913): 150.